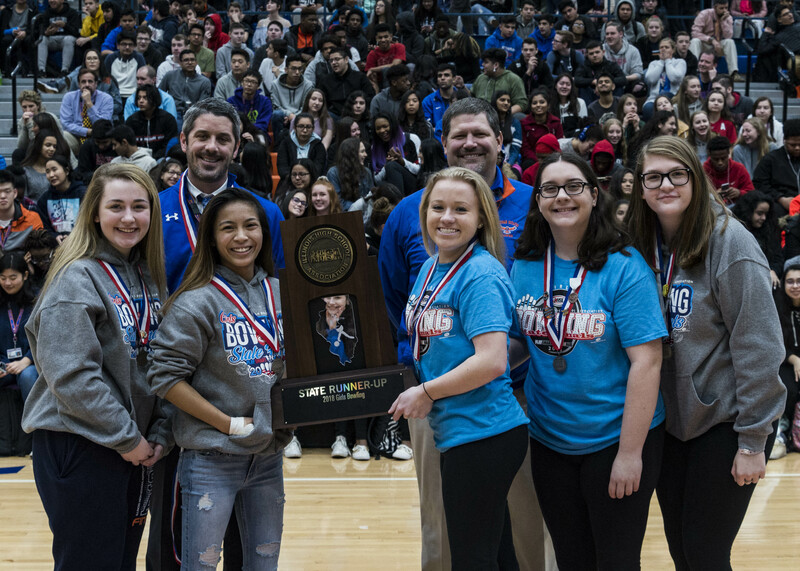 Members of the Hoffman Estates High School Girls Bowling team, head coach Dan Pfligler, and principal Josh Schumacher pose with the state runner-up trophy during an assembly honoring the girls’ achievement. Hoffman Estates and Schaumburg High Schools’ girls bowling teams captured second and third place following the Illinois High School Association’s state bowling finals in Rockford Feb. 16-17. 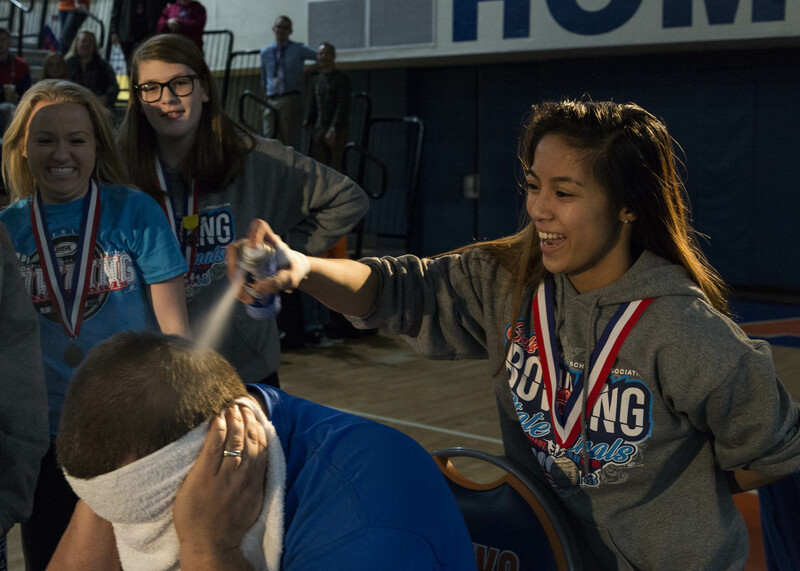 Hoffman Estates High School senior Allura Magsino sprays blue hair dye on bowling coach Dan Pfligler during an assembly honoring the team’s second place finish in the state bowling championship. 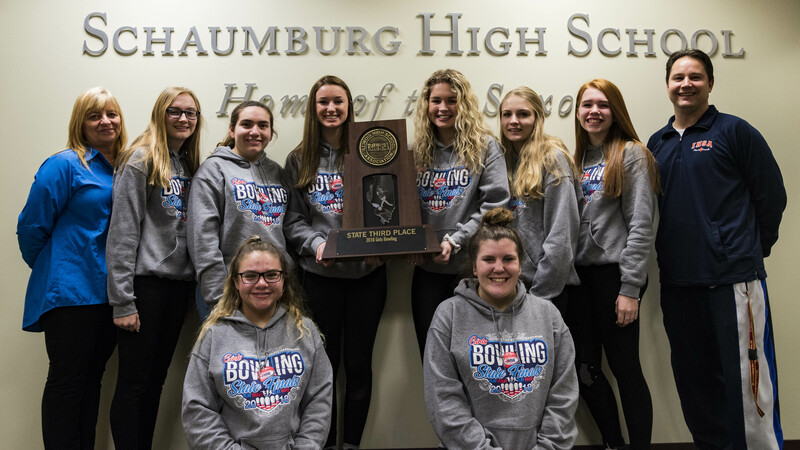 The Hawks bowlers were honored with an assembly at the school Feb. 20, where the girls painted head coach Dan Pfligler’s hair blue and presented the trophy to principal Josh Schumacher. The Schaumburg girls captured the third-place trophy with a team average of 194.1 finishing only 45 pins behind their fellow District 211 team. Junior Kylie Frick led the Saxons with an average of 209.7. Frick’s average gave her a 7th place overall finish. Members of the Schaumburg High School Girls Bowling team pose with the IHSA third place trophy.